We continue to remain invested in high quality small and mid cap companies with strong fundamentals and increase allocation in these companies in case of fall in stock prices during market correction.We believe any major correction in current market must be considered as a buying opportunity. We expect cyclical stocks with strong fundamentals will continue to outperform going forward considering ease in interest rates, stable crude oil prices and higher spending. Sharp fall in stock prices last year in the month of November created panic situation for many new investors without any cues and put them on back foot when it comes to investing in equities. In the month of Dec'16, many investors were expecting further fall in stock market due to demonetization impact and hence remained on sidelines. However, since beginning of this year, we witnessed strong rally across all broader indices as initially Domestic Institution were buying and supporting the market and later FII turned to be net buyers. BJP victory in UP with the biggest margin in 37 years followed by positive developments like GST implementation by July as per schedule and normal monsoon forecast by IMD (India Meteorological Department) has set the markets outlook bullish with major indices making new highs. The BJP landslide victory with clean sweep in UP and Uttarkhand gives further comfort for 2019’s Lok Sabha elections with high expectation of stable government for next seven years. Political stability is one of the most important factor for economic growth and development of any country, it not only give confidence to Investors but also allows government to implement various policies and reforms smoothly. This will augur well for Indian stock market in long term and hence we continue to remain bullish on Indian equities. High quality companies reporting 20-30% + annualized growth can deliver exceptional returns for the shareholders in long term. In case you have not yet started building a portfolio of high quality and high growth stocks for long term wealth creation, please find below the Wealth-Builder portfolio allocation for your reference. Since inception, our Wealth-Builder portfolio has outperformed Nifty and Sensex by wide margin. Since 1st Jan 2013, Nifty has given returns of 62.4%, Sensex returns is 59.7% where as our Wealth-Builder portfolio has given returns of 350.4% to our members. 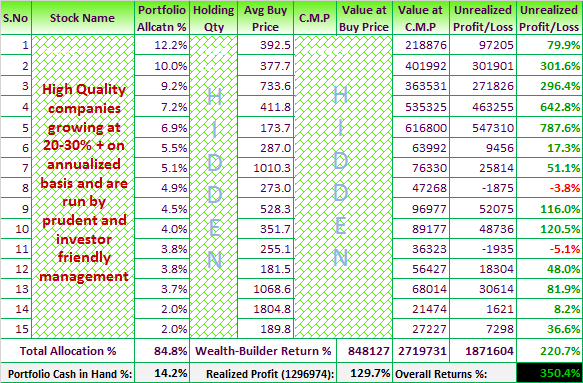 In terms of performance, 8 top performer stocks out of 15 of Wealth-Builder portfolio have given returns in the range of 80% to 790% since 1st Jan'13 that too when many of these stocks out of 15 were added in portfolio during last couple of years. Moreover, 10 stocks out of 15 have made 52 week high / all time high recently. We continue to hold these stocks as we believe these companies are registering good growth every quarter and doing all the right things to continue delivering robust top line and bottom line with strong operating margins. There were few laggards also which have not performed up to our expectations and we exited these stocks and allocated the available funds to other good investment opportunities to ensure that Wealth-Builder portfolio continue to outperforms major indices by wide margin. Note: Wealth-Builder portfolio update - June 2017 will be released on 11th Jun'17 and we will share the same with our Wealth-Builder members. Wealth-Builder is our offline portfolio management service. Using Wealth-Builder, you can manage your portfolio like a professional. 3. You Harvest – It’s a fact that equities can give you maximum returns compared to any other asset class if invested with a long term horizon (3 to 5 years and above). Investing in fundamentally strong small and mid cap companies ensures that you keep harvesting your money in form of regular and higher dividends year after year along with capital appreciation. 4. Exposure to our well researched stocks - Hidden Gems and Value Picks. Wealth-Builder ensures giving better returns compared to major indices like Sensex or Nifty. Wealth-Builder subscribers need to replicate our recommended portfolio in exact proportion. For ex: If we recommend to invest Rs 50,000 in “x” company with portfolio allocation of 5% in Rs. 10 lakh portfolio, subscriber starting his portfolio with Rs. 2 lakh need to invest Rs. 10,000 in “x” company with similar portfolio allocation i.e. 5%. On monthly basis, we review Wealth-Builder portfolio and update our members in terms of any changes in allocation or exit / entries in stocks based on fundamental analysis and recent developments in these companies. Start managing your equity portfolio like a professional, subscribe to Wealth-Builder by paying nominal annual fee of Rs.20,000 for entire year. Click here to subscribe to Wealth-Builder online. You can avail attractive discounts on our combo packs, click here for details. In case if you are not comfortable in making online payment, click here to know about our other payment options and bank details.